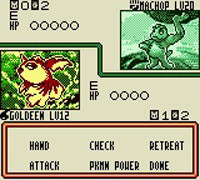 Based on the Pokémon Trading Card Game by Wizards of the Coast, you play a boy named Mark who wants to become the Pokémon TCG champion. He gets his first set from the local professor, and is taught how to play. Choose a Pokémon card from your desk and issue Energy cards of the right type to it so it can use its attacks. Outside of card battles you can issue challenges to other characters and collect cards and items. You can also arrange your deck and develop strategies to use in battle.